My Daily Knit: One of my designs in Knitter's Magazine! 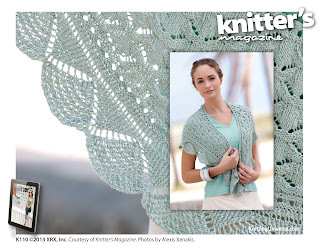 One of my designs in Knitter's Magazine! It doesn't matter how many years I've been doing this (30+) and how many times I've had designs in print, it's always exciting to see! Kind of like handing over one of your babies and seeing it again after being pampered, powdered and dressed for the camera. When you work with publications, you turn in your finished design months ahead of it reappearing in print, and sometimes by then you forget how it looks. So I was pleasantly surprised to receive these beautiful photos. They do showcase well the stitch pattern, worked in Cozette, a buttery soft yarn new to Knit One, Crochet Too for spring. 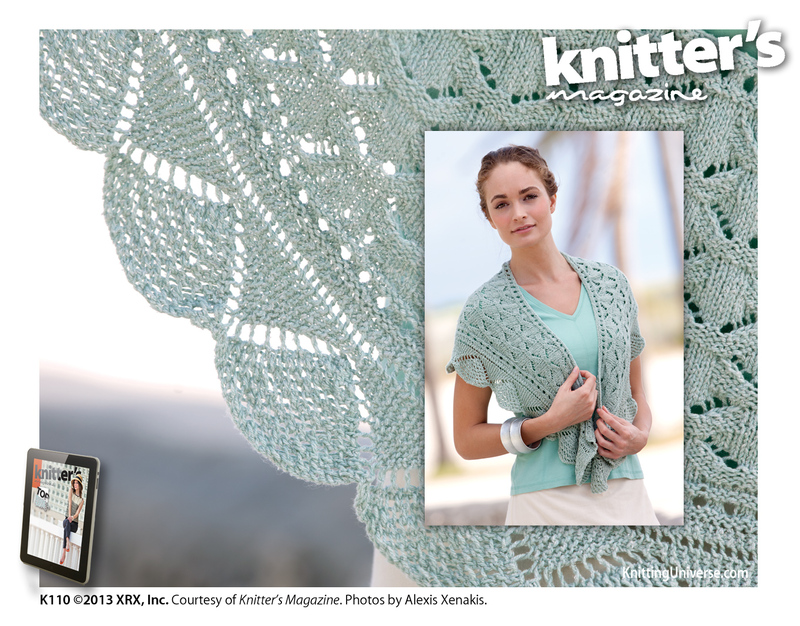 The Seafoam Shells shawl pattern can be found in Knitter's Magazine issue K110, on pages 72-73, and is available now. You can see more in this issue here. I worked the shell edging first, side to side. I then picked up stitches along the straight edge and worked a few rows on all the stitches. To begin filling in the upper section, I started working short rows, adding more and more working stitches each side until all stitches are worked across each row. The trick to make the upper edge curve in a little, and help the shawl stay better on your shoulders, is to bind off the stitches firmly at the top edge. The main pattern stitch was originally a solid stitch without any yarn overs. I tweaked it to include the yarn overs and give it a more openwork lacy feel. 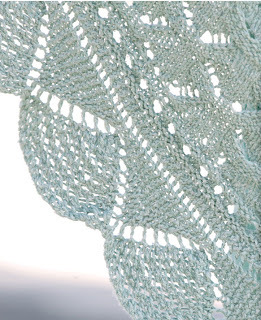 Both lace patterns, for the edging and the main section, are given in chart format. nice! a pretty little shawl! thanx for showing it off.